I DON'T LIVE IN RESIDENCE, CAN I EAT IN ROSARIA DINING HALL? Yes! Everyone is welcome to dine in Rosaria Dining Hall. Pay door prices or purchase a Swipe & Save Dining Plan. WHAT ARE SWIPE & SAVE DOLLARS VS. SWIPE & SAVE PLANS? Swipe & Save Dollars are dollars on your student ID card used in Seton Cafe and Rosaria Dining Hall. Swipe & Save Dining Plans are meal based plans for use in Rosaria Dining Hall. Swipe & Save Dollars is a declining balance added to your MSVU student ID card. You can load any amount of Swipe & Save Dollars to your ID card via our online service. The minimum load is $25. If you wish to load money onto your card in person you can visit any of our locations and the cashier will load in increments of $25. You can use your Swipe & Save Dollars at Seton Cafe, McCain Cafe and to access Rosaria Dining Hall. There are several different types of Swipe & Save Dining Plans. Some plans are meal based for use at Rosaria Dining Hall. For example, you may choose to purchase the Lunch Pack 25 Plan if you want to eat in Rosaria once or twice a week for the semester. 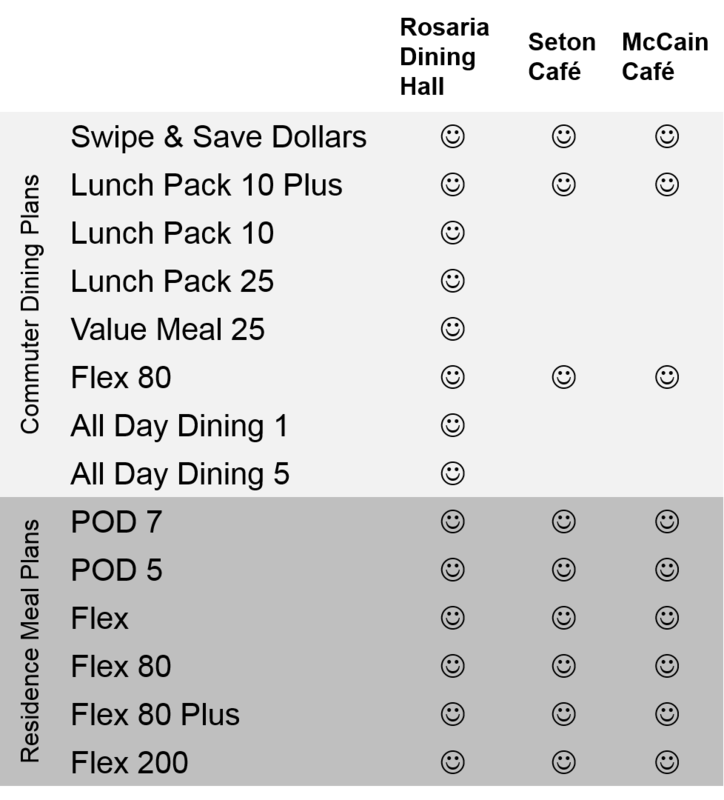 If you plan on taking advantage of the all-you-care-to-eat dining hall everyday you're best option is to purchase one of the POD Plans that give you the flexibility of unlimited dining at the dining hall and Dining Dollars for tax free purchases at Seton Cafe and McCain Cafe. Visit the office in Rosaria Student Centre to purchase this plan. It's easy! Purchase your plan online or purchase at the cash register at Rosaria Dining Hall. We accept MasterCard and Visa. For more information on purchasing please contact Chartwells Office (Room 303B in Rosaria Student Centre) or call (902) 457-6253. Sorry, you are not allowed to take food out of Rosaria Dining Hall. These plans are for food that is consumed in the dining room only. Report your lost or stolen ID card to the Chartwells Office (Room 303B in Rosaria Student Centre) so your personal dining plan can deactivated. A new ID card must be purchased at the MSVU library. Email or visit the Chartwells office to ensure your dining plan reactivation has taken place. Your activated student card is the key to the whole dining plan system. If you forget it you will have to pay cash to gain access to the dining hall. The security of a card remains the cardholder’s responsibility. Cards should be treated like a credit or debit card. If a card is lost or stolen the cardholder is responsible for all charges made to that card until the card is reported lost or stolen. A card can be reported lost or stolen at the Chartwells office. POD stands for Pulse On Dining. It's our exclusive dining program that includes all-you-care-to-eat dining and myPantry. All-you-care-to-eat means once you swipe into the dining hall for a meal, you can eat as much as it takes to satisfy your hunger. You can hangout in the dining hall all day if you wish - just remember to re-swipe when the meal service time changes. myPantry is a self-serve kitchen located right in our dining hall. Students are encouraged to prepare their own food with friends from a full-stocked fridge and pantry. A grocery list is available if something important is missing from the kitchen! Commuter plans are based on swipes of the card so if you would like to invite a friend to dine with you we would welcome the opportunity to serve them. The Ultimate 5 Day and Ultimate 7 Day plans can only be used by the subscriber. If you have a family member or friend visiting and wish to dine with them at Rosaria Dining Hall, your guest is welcome to pay at the door, purchase one of our NEW All Day Dining Plans or any of our other plans. You can also treat your guest to a meal by using your Dining Dollars. Residential dining plans are only refundable if you withdraw from residence or from the university. Please contact Financial Services for full details.